The Illustrious Awards – Page 2 – The Most Coveted! Mr. Arthur O. Eve, acclaimed for being the first Dominican elected to public office in the United States, will travel from Buffalo, NY, to Newark, NJ to receive The Illustrious Lifetime Achievement Award for his many contributions to the advancement of US diverse communities. He served with distinction as New York State Assembly member for 36 years (from 1967 to 2002). During his time in office, he was one of the highest ranking members of the New York State Legislature. He served as Deputy Speaker of the NYS Assembly from 1979 to 2002. Mr. Eve rose to prominence in the mid-1960s during Buffalo’s civil disturbances. He expanded his notability during the Attica Prison Riots. In Buffalo’s Civil Rights Movement riots, Mr. Eve attempted to organize formal meetings in order to avert physical confrontations. He is credited for being one of the founders of the NYS Black, Puerto Rican, Hispanic and Asian Legislative Caucus. During his first term he led the effort to obtain an initial $500,000 of funding to establish the State University of New York’s SEEK/Educational Opportunity Program. Since its inception, the program has helped thousands of students in both The State University of New York and The City University of New York. Mr. Eve is recognized as a leader on just about every issue that’s important to families. Many believe that during his career of public service Eve has done more to initiate opportunities for minorities and the economically disadvantaged in the field of educational opportunity, undergraduate and graduate education, medical degrees, pre-natal, day care and infant care, than any other state legislator in the nation. The Illustrious Awards document and highlight the contributions of Latino icons to the advancement of the United States of America and its diverse communities. Mr. Eve will attend the Illustrious Awards Ceremony slated to take place on Saturday, September 24, 2016 at 6pm at Rutgers University Robeson Campus Center located at 350 Dr. Martin Luther King, Jr., Blvd Newark, NJ 07102. 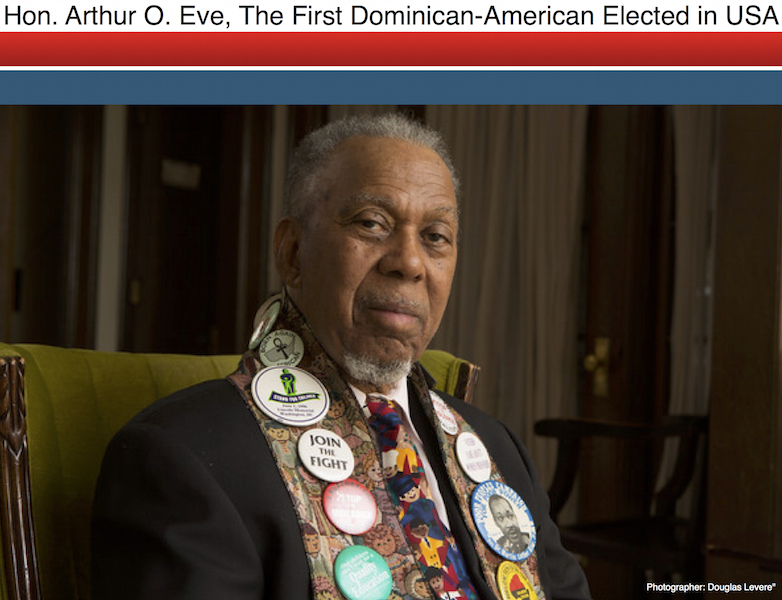 ILS research conducted by Néstor Montilla, Sr. indicates that Mr. Eve’s father, Arthur B. Eve Sr., was born in 1912 in Puerto Plata, a province on the northern cost of the Dominican Republic. His mother, Ruby Wilson Eve, was from the Bahamas in the Caribbean. “My father was Dominican and my mother from the Bahamas,” he stated to Montilla during a video interview at his residence in Buffalo, NY. According to Montilla, in the 1920s, in the midst of the 8-year U.S. occupation of the Dominican Republic, Eve, Sr. his seven siblings and their parents, immigrated from Puerto Plata, Dominican Republic to Miami, Florida, where they settled. Subsequently, in his early twenties, Eve, Sr. moved with his wife and her mother to new York City, where his so Arthur O. Eve was born in Harlem on March 23, 1933. A video excerpt of Mr. Eve’s life story will be featured at the event on September 24th. His complete life story will be featured on The Latino Illustrious, an original documentary to be released in 2017.